It has been a long week for me but I managed to get this out to you all. As I work on a project for a major Fortune 500 client, we are spending our evenings with building the best in class Social CRM product to launch this year!! I am loving every minute of it!! Stay tuned in August of 2009 for the debut of our Social CRM Product that will easily integrate with Salesforce.Com. It will be available for Free Download next month on our site. From there we will be introducing to you the same capability into Oracle, Siebel, Zoho, and all other CRM platforms. thought your company does not need a Social CRM strategy - Best Buy, Coca Cola, and Microsoft announced their products and strategy. Learn what they did so that you can rocket launch your business! Also in this newsletter you can check out our video demos of CoTweet. CoTweet is a Free Social CRM tool that you can use to service, support, and market to your customers using the Twitter platform. Social Interactions Built into Microsoft's Dynamics CRM Suite of Products. So Microsoft has been a little behind the Twitter bandwagon. It wasn't till just over 1 month ago when they officially launched a Twitter Channel which is currently being used for Marketing purposes. However, it looks like they are making strides in the Social CRM space by announcing last week that they are introducing Twitter capability into their Dynamics CRM application. The application will allow you to monitor, manage, and support social conversations related to your brand's conversations. Learn why Best Buy Chose To Invest Resources in Twitter for Sales & Support. Best Buy Co., the world's largest electronics retailer, is building a customer-service team that will use Twitter Inc. to answer questions about products to help increase sales. Starting July 19, Best Buy's "Twelpforce" will search Twitter posts to find people seeking information about flat- panel televisions and other electronics, Chief Marketing Officer Barry Judge said in a telephone interview today. More than 500 employees at stores and at the company's Richfield, Minnesota headquarters are signed up to participate, he said. How Coca Cola utilized Facebook, and their Fans to Increase Sales! This article by Paul Greenberg provides a great summary on how Coca Cola truly leveraged the Facebook platform to create a world class community of customers on their network. Learn why JetBlue, BestBuy, and So many others utilize this application. Check out this video demo of CoTweet in action. 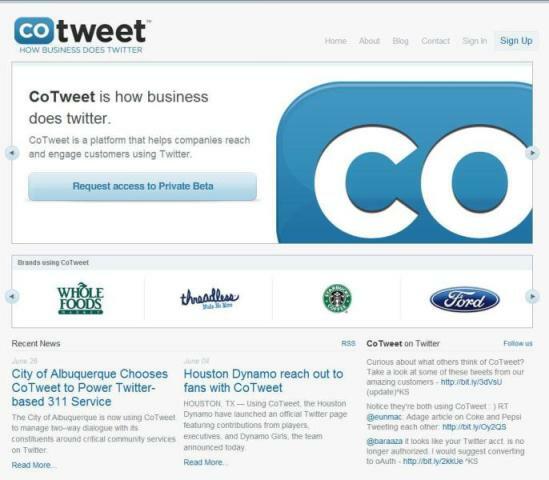 John Perez of http://www.service-push.com (A Social CRM Consulting Firm) demonstrates how you can support your customers and twitter conversations using Co Tweet. Can co tweet replace traditional ticketing systems for small businesses?